Media Mensch: Businessweek.com - "In Your Face"
Businessweek.com - "In Your Face"
This week was an amazing media week. A comment I wrote about how to re-energize Starbucks was featured at the top of Businessweek.com's new In Your Face page which was added to their home page yesterday. They created this picture. I also had the opportunity to kick off my new MediaMensch radio show with an interview featuring Howard Behar, former president of Starbucks North America and International and current board member. The show can be found at www.blogtalkradio.com/mediamensch. In addition, I was introduced to an "experimental" Starbucks drink this week which was a "Mint Chocolate Chip" frappucino. It is not on their menu and tastes exactly like the ice cream. We submitted the idea to Starbucks this week as well and thought they could do a "Green Day" on Earth Day with Green Teas, Green Lattes, and test this new Mint Chocolate Chip Frappucino. Congratulations on the launch of your new radio show and for being quoted in Business Week! 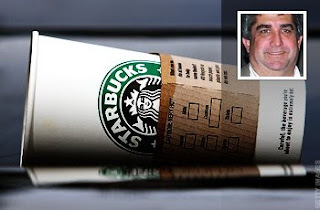 I am having difficulty finding the comment you made about Starbucks in Business Week...can you pls share that?